Old school is definitely on the rise in the Netherlands. With 3 tournament organizers in 2017 we have grown to 7 organizers with, one or more, confirmed tournaments for 2019 (minus 10 persons gigs excluded). Combined with the fact that the Netherlands are quite compact, all can be reached within 3 hours, we probably are the country with the highest tournament per square kilometer ratio. For me personally this is perfect to try different decks. I can imagine that if the opportunities would be less that I would stick to one pet deck. But now if my deck doesn’t work out, there will be another opportunity around the corner. Speaking of around the corner, because the Netherlands are small joining an opportunity or two in our neighboring countries is also a valid option. And that is how the story of the knight becoming a paladin started. I went full flavor at the tournament of Florian and Marc (I know it’s Germany but as I mentioned it was close enough). A pirate theme was slightly enforced and since the always friendly Florian is a frequent attendant of the Dutch tournaments a felt like pleasing him and going full flavor. Pirates and especially island walking was enforced. So finally an opportunity for my Lords of Atlantis to shine. Lords means Merfolk and so I would brew my first OS fish deck ever. Doing some brewing on my own, not enough play testing and overestimating the flavors of the decks my opponents left me with finishing last. I went 0-5 that day and still had a blast. 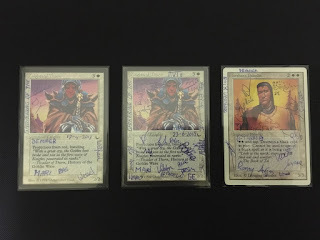 However there is this winning itch so I promised myself a treat, I would pick up my winning deck from the “Gathering of the Knights of Thorn IV” once more. 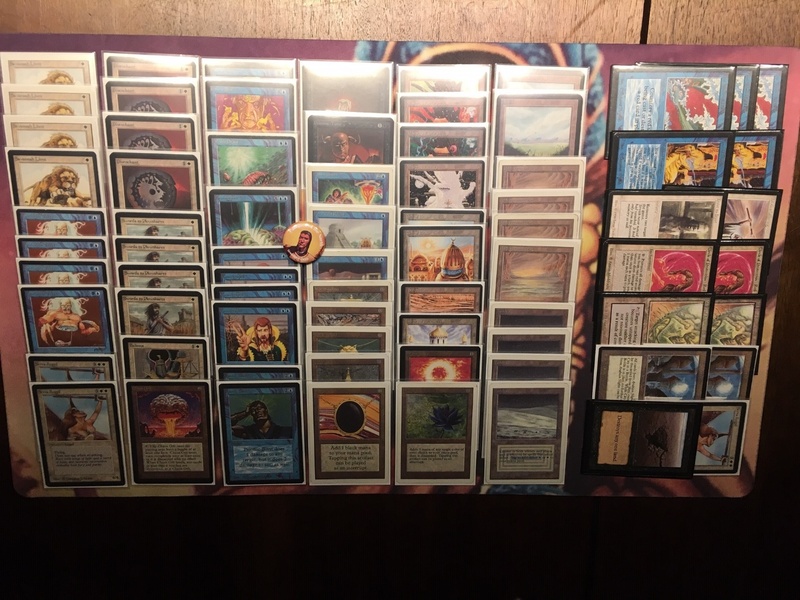 In the 2 weeks that passed I reassembled the deck which is basically the winning deck from N00bcon X but with more black mana sources so it can support a SB Sinkhole. Because land based threats are hard to deal with and can seriously disrupt the original deck. At least that’s what Jason and I found out during two evenings of thorough play testing in preparation for KoT IV. During the last evenings before Paladins of the North I did some more play testing just to get the feeling back, re-evaluate the SB and going through the SB choices to make depending on the opposing deck. Day of the Paladins of the North tournament. Good guys Koos and Jasper had picked a cafe formerly named Atlantis (if they hadn’t changed it I might have been tempted to bring my fish deck again). The place was great for a 20 person capped tournament with nice draft beers and an abundance of snacks. After some introductions, 10% of the attendees had never joined and OS event before, and laughs about one certain person probably not reaching top8, due to habit of finishing ninth, we started. I kept a strong hand with all the white removal, a factory and an Serendib together with all the needed mana colors. Sander started and stone rained the factory first and the tundra second. Leaving me with 5 white spells in my hand. He used the disk to get rid of my Serendib and my Psionic Blasts proved useless against his Army if Atogs. Hence I was looking at my first loss. Okay these thing happen. Nothing a bit of good sideboarding wouldn’t solve. Out with some lions, the emerald and the twister and in with 2x CoP red, another angel and the Divine Offering. Game 2 and 3 where a walk in the park due to an early CoP in both games. Also the fact that he wasn’t playing an Orb didn’t help him. All I had to do was to keep artifact removal in my hand for the disks and fly over his creatures. Result 2-1 in games and 1-0 in matches. Nick and his brother Koos (the organizer) are truly bitten by the OS bug and in this case that wasn't helping him; I had played him and his version of the Deck numerous times. Sorry Nick. So my plan was to play early treats, make sure to disrupt his card advantage and watch out for the abyss. Game 1 was never really a game, he had to mulligan to 5, I twisted him for 3 and after a Timetwister I Mind Twisted his hand again. Did I already say sorry? I sideboarded out my Timetwister and 2x StP and in with the Divine Offering and 2x Blue Elemental Blasts. Game 2 was over just before it got tricky. I used my disenchants on his Tomes and top-decked an answer for his Abyss. A Serendib together with a factory killed him. Result 2-0 in games and 2-0 in matches. Round 3; Peter; the Deck? Enthusiastic as always Peter started with telling he had built another deck. Which was good since I played against him last tournament. Game 1 took a long time during which I saw Taigas and other cards I couldn’t really place so he had definitely changed his deck. It was more control and card advantage but just not fast enough. Tomes are quite mana intensive if you keep getting them disenchanted. After this long game and long sideboarding during which I boarded in my CoP red and Blue Elemental Blasts we took off for game 2. I had to mulligan and kept a hand which proved to be just to slow. My treads got taken care of, Peter slowly started to build board presence and time was called. I had turn 1 of the last 5 turns. So 3 more attack phases with my flying army. I just had to protect my forces and hope for the best because it was going to be close. During turn 2 Peter casts a time walk and destroys my plan. Now with him having 3 of the final 5 turns things changed dramatically. Every turn he draws multiple cards of the Tomes and he should have enough burn for the victory. During the last turn after counting everything over and over he decides to tap out for a lethal fireball which I counter and steal the match by doing so. Result 1-0 in games and 3-0 in matches. Without a break between the rounds my focus is fading. Luckily Henk knows how to motivate me by raising the stakes. I get to sign his playmat if I win. Game on buddy! Henk starts with lots of mana rocks, I let him and without counters decide to go full on the attack with my creatures. He plays a Mana Vortex, annoying but hey I have creatures. Then he plays the Abyss, he definitely wants to play with the big guys. Unfortunately for him I’ve a mind twist and when stripped of all his answers I take an extra turn and kill him of with my last creature. I’m not really sure what to sideboard but take out the Braingeyser and an Angel and put in some Control Magic. The changes prove to be superfluous since I’m able to counter and disenchant all his treads and before long I’m writing my name on his playmat. Result 2-0 in games and 4-0 in matches. I face Erwin; Dutch old school player of the first hour and organizer of the Dwarven Warriors tournament. We are both on 4-0 and both know that we’ll make top 8. So the start is full of camaraderie and again I lose some focus. This leads to me casting a Disenchant in response to his Chaos Orb, I feel stupid because I know this and this is only round five. So I force myself to focus on the game and not to fool around anymore. Because if I lose this match he’ll probably tell me the story for the rest of my life. He plays his second Mana Vault and I recall that this tapping to untap the other one doesn’t work but can’t figure out why. Eventually the errata helps out and the 2 Mana Vaults prove to be a real threat. I just wait to see them chip away his life and when he finally takes the cost to untap I Disenchant them. My deck has multiple answers for each of his spells and game 1 ends in my favor. I sideboard in some more artifact hate to make game 2 even more one sided. This results in me being the only one going to the finals with 5 wins. Result 2-0 in games and 5-0 in matches. Björn is an organizer of multiple eternal tournaments per year and tough opponent. He didn’t know he would attend the tournament until 2 hours before the start. But due to a last minute dropout he rushed to the site to join, that’s commitment. His deck was a last minute build because of this. I don’t recall much details of our games except that his sideboard options where limited giving me a better position in game 2. Result 2-0 in games and 6-0 in matches. Richard is one of the two organizers of the Raging Bull series of which the first tournament is scheduled. We are asked to play on stream but declined. In hindsight this is a pity because the 3 games prove to be a blast with multiple instances of us being in top deck mode. From previous tournaments I recall him playing a GW deck so I’m surprised to face a Juzam early game. Swords are great against those monsters except for the fact that they give him life. Life means turns and this proves lethal. Underworld dreams and Serendibs on my side chip away everything during multiple turns in top deck mode. Okay no worries I know what to SB in, 2x Maze of Ith. I’ll give you your own time bombs. Next to these I toss in some Control Magic and another Angel a couple of the Lions can stay at the savannah together with some blue sorcery spells. Game 2 starts differently, I have to sword a Hippie and a Royal before we see our first Juzam. I play my Maze of Ith and grin back at the green monster. The SB choices pay off. The ticking time bomb together my flyers make his life total dwindle. Richard has to Swords all my threads so I end up back at 20 after being at 9 somewhere along the way. Because of this I don’t have to reset my life total when we start our final match. We both sideboard I switch the Control Magics back for the blue sorceries, they are just too risky with all the removal and Disenchants. Game 3 is again a different match, Richard plays less creature based threads but his Icy’s and Underworld Dreams and giving me a hard time. Finally I stabilize by Mind Twisting his hand and deactivating his Library in the process. One of my Lions does some damage but gets a top decked Sword the turn before it can deal lethal. Then everything changes I draw lands for turns in a row have to Sword one of his creatures bringing Richard back to 4. What’s even worse is that his hand size is back to 7 and that he plays a Icy. This Icy could be used to tap my City of Brass so I really have to topdeck something good. It proves to be a Psionic Blast which seal his fade, o man those where some intensive games. Exhausted and low on sugar I force-drink myself a sugar loaded coffee and a cola. Result 2-1 in games and 7-0 in matches. Jimmy is the other organizer of the Raging Bull series and I know he is an experienced the deck player. After already having defeated 3 of those decks I feel confident in having a real chance but still these are the finals. It will be my first streamed match ever which adds just enough tension to bring my focus back. Game 1 starts and I know that I have to keep my hand when I see a Lion, a Pearl and a Factory. These are exactly the early threads I’m looking for when on the play against the Deck. Jimmy opens with a Library and I hope for the best. I start to race him and eventually get him down to 4 but then he plays an Ivory Tower. Now he gets life and cards for having a full hand. I top deck a Tutor and search for a Balance which I cast as my last card. Unfortunately he top decks better and I basically lose this game to the Library. This is my chance to sideboard the Sinkhole together with some artifact removal and out with a Swords and the Braingeyser. Game 2 is quick with Jimmy having to mulligan and not drawing the answers against my army. I see some creatures on his side so he did change something. But without the gas of the Library we quickly go to our last game. A true final consists of three games right? I keep an explosive hand after a mulligan and even get some cards of a Library along the way. But it’s my removal including the Sinkhole that brings me the victory and the Northern Paladin trophy. 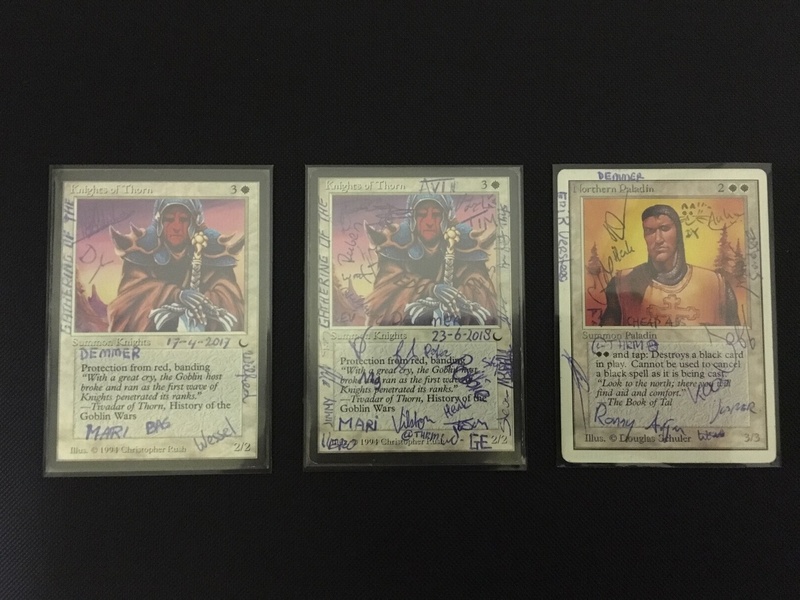 Paladins of the North is a real contribution to our series of Dutch Old School tournaments. It has some great hosts in Koos and Jasper and the location is nice. But a tournament on a Sunday is a challenge as shown in the number players still attending during the final. Regarding my deck and sideboard, it’s solid, has answers to everything and is resilient. It has all the good creatures to battle a creature based deck and they are fast enough the win against a The Deck. Well at least during this tournament as I defeated 4 of them. 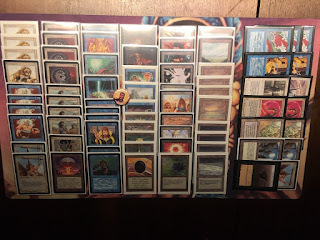 Out of the 15 sideboard cards I used 13 multiple times. Only the 2 Cities in a Bottle never left the sideboard and the Control Magic feels like a win more. The Sinkhole on the other hand is good and could use a second copy. Special thanks to Dyan for letting me use his photos to spice up the report. Hence a picture of him unlocking the Earth, Wind (air is close enough) and Fire Elemental achievement.